Anatomy and physiology is the study of the human body and how it functions. Anatomy focuses on the names and identification of the physical structures making up the various systems of the body. Physiology is the study of the chemical and biological processes that explain how the various parts carry out their functions in maintaining a healthy, well functioning body. Generally this class takes a system-by-system approach to studying of the skeletal system, the integumentary system, the muscular system, the digestive system, the circulatory system, the endocrine system, the nervous system, the urinary system, and the reproductive system. In addition to normal functions, there will be some study of common health problems related to those systems and how to prevent them. Biology is a laboratory course involving the study of living organisms. Various areas of field biology (insect collecting, bird watching, flowers, etc.) will be studied. Basic functions of cells, genetics, a survey of the animal kingdom, theories of evolution and creation, and environmental issues will also be studied. Biology II is a course designed to expand upon topics and themes introduced in Biology I, as well as to study new topics of importance and interest. Because knowledge and technology in the life sciences is constantly increasing in volume and complexity, this course will offer students the opportunity to be better prepared for educational routes beyond high school, and should be especially useful for students planning on taking science courses at the university level. Major content areas will include biochemistry and cellular biology, microbiology, embryology, and plant and animal physiology. 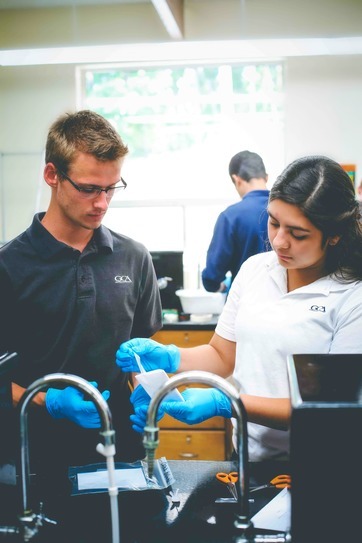 Lab experiences are an important component of this course and are designed to give students the practical experiences necessary to be successful when pursuing college-level science courses. Chemistry is a laboratory course designed for students who plan to enter medical or other science-related careers. It involves the study of matter, the way it behaves, and how our lives are affected by the use and misuse of chemicals. Emphasis will be given to learning chemical names and formulas; mechanisms of bonding between chemicals; writing, balancing, and using chemical equations to describe chemical activity; the study of states of matter, especially the gas laws; and an introduction to organic chemistry. Prerequisite: Minimum grade of C in Algebra I.
component that requires students to commit to an additional morning lab period once each week. This course prepares students to take the College Board's AP Chemistry Exam in May. Students also have the option to receive credit for first semester majors¹ chemistry (CHEM 151) from Southern Adventist University. Approval for credit for second semester chemistry (CHEM 152) is being requested. Prerequisite: Minimum grade of B in both Chemistry I and Algebra II. This course is an introduction to the general principles of chemistry and physics. Some laboratory experience with opportunities for hands-on activities will be included. The practical applications of scientific thought and principles are emphasized. Scientific evidences of God’s existence and power in the natural world are unveiled. Physics is a laboratory course involving the study of the interactions of matter and energy. General topics include laws of motion, application of forces, energy, work, power, sound, light, electricity, and magnetism. Special emphasis is placed on understanding the physical phenomena that a person encounters in everyday life. Prerequisite: Minimum grade of C in both Algebra II and Geometry. Georgia-Cumberland Academy’s Healthcare Science class has been designed for any junior or senior student wishing to pursue a career in a healthcare field or anyone needing a fourth science class required for graduation. The course provides students with an initial exposure to Healthcare Science skills and attitudes applicable to the healthcare industry. Students will have the opportunity to explore to many Healthcare Science careers as well as skills in employability, communication, and professionalism required in each. The concepts of health, wellness, and preventative care are evaluated, as well as ethical and legal responsibilities of today’s healthcare provider which can empower students as healthcare consumers. Some of the fundamental healthcare skills include medical terminology, work safety, microbiology, survey of human anatomy and physiology, human growth and development, and basic life support.